Would you like to allow users to register to your WordPress site? 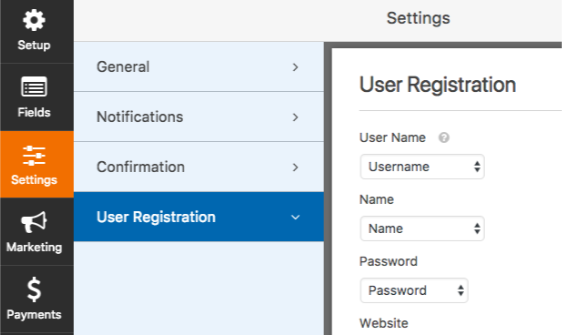 With our User Registration addon, you can easily create custom user registration forms. In this tutorial, we will show you how to install and use the User Registration addon for WPForms. 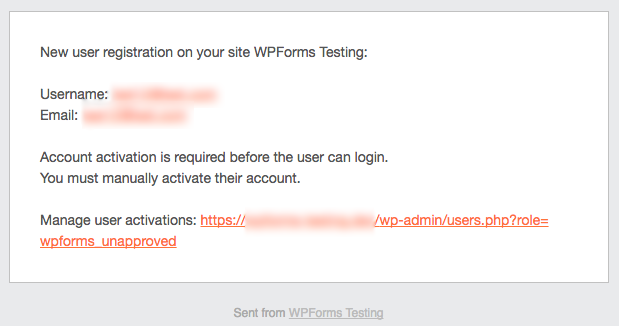 Before we get started, be sure to install the WPForms plugin on your WordPress site. Next, go ahead and install the User Registration addon. 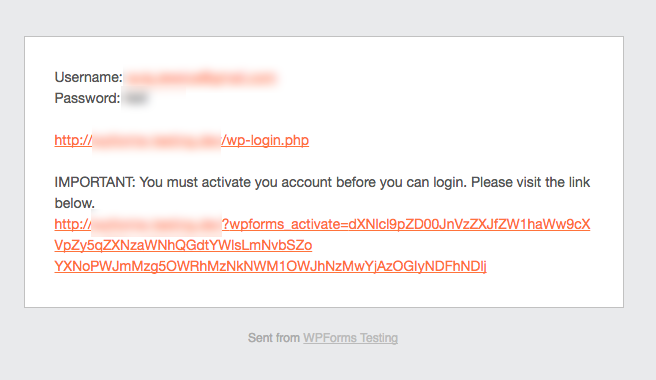 For more details, please see our step by step guide on how to install addons in WPForms. Once the addon is installed and activated, we can create a new form for user registration. To do this, go to WPForms » Add New. This will open a page with a list of available templates. Within the templates list, select User Registration Form. You can change or remove these fields, or add new fields to fit your needs. Note: If you’d like to add more information to user profiles such as Birthday, Address, and more, check out our tutorial on setting up custom user meta fields. Once you feel your form is ready, we can configure the User Registration settings. To do this, go to Settings » User Registration. On the settings page, you can map each form field to a field in the WordPress user profile. To map a field, just select a form field from each dropdown. If you’re using the default template, these fields will already be filled out for you. User Name: Required for a WordPress profile. However, if empty, the user’s email will be used instead. Password: Required for a WordPress profile. To provide a random, strong password to the user you may select the Auto generate option. Below these settings, the User Role dropdown will determine which role new users are assigned when they register through this form. If you’d like more details about roles in WordPress, check out WPBeginner’s guide to WordPress user roles and permissions. Last, you can choose whether registration emails are sent out and what actions must be taken in order for the registration process to be completed. Note: Any emails enabled in user registration settings would be sent in addition to the form’s notification emails. When Send email to the user containing account information is checked, the user will receive a short email containing their username and password, as well as the login URL for your site. 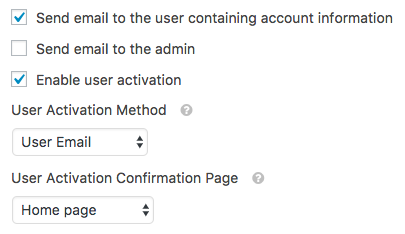 If you’d like to require the user to confirm their email to activate their new account, check Enable user activation. Then, set the User Activation Method dropdown to the User Email option. This will send an email with a link that the user must follow to complete their registration. If both user email options are enabled, they will be included in the same email. With the User Activation Confirmation Page dropdown, you can also choose which page of your site the user will see after clicking this activation link. By checking the box to Send email to the admin, the site’s owner will receive an email including the Username and Email of any users who register. If you’d like to manually approve new users, you’ll need to check the Enable user activation option. Then, set the User Activation Method dropdown to Manual Approval. If you enable both of these admin email options, they will be sent within the same email. That’s it! 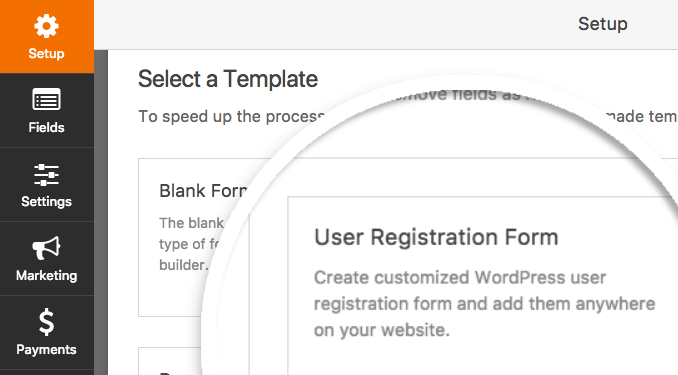 You can now add a custom user registration form to your WordPress site. Next, would you like to collect payment before allowing new users to complete registration? For more details, be sure to check out our tutorials on adding Stripe or PayPal to your form. Changed: Always show forms with Login template inside Gutenberg. Fixed: nickname user meta unable to be assigned after user registration.. Fixed: Remove functions deprecated in PHP 7.2. Fixed: User account created when form contains errors. Fixed: Typo in user activation email.